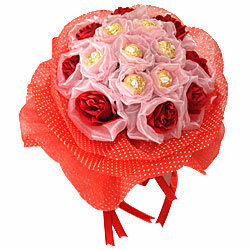 Send this lovely gift of Precious Pure Expressive Love Gift Set to your dear ones and make them feel very happy. This Gift Set is associated with Imported Silk/Art. Red Roses and Original Ferrero Rochers Chocolates. You can wash the Flowers.